Louisiana Governor To Be Youngest In U.S.
U.S. Rep. Bobby Jindal won the Louisiana governor's race Saturday, becoming the nation's youngest governor and the first non-white to hold the state's post since Reconstruction. 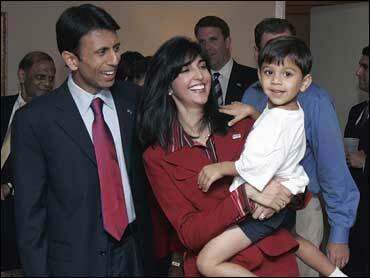 Jindal, the Republican 36-year-old son of Indian immigrants, carried more than half the vote against 11 opponents. With about 92 percent of the vote in, Jindal had 53 percent with 625,036 votes - more than enough to win outright and avoid a Nov. 17 runoff. "Let's give our homeland, the great state of Louisiana, a fresh start," Jindal said to cheers and applause from a crowd that began chanting his name at his victory party. His nearest competitors: Democrat Walter Boasso with 208,690 votes or 18 percent; Independent John Georges had 1167,477 votes or 14 percent; Democrat Foster Campbell had 151,101 or 13 percent. Eight candidates divided the rest. "I'm asking all of our supporters to get behind our new governor," Georges said in a concession speech. The Oxford-educated Jindal had lost the governor's race four years ago to Gov. Kathleen Blanco. He won a congressional seat in conservative suburban New Orleans a year later but was widely believed to have his eye on the governor's mansion. Blanco opted not to run for re-election after she was widely blamed for the state's slow response to hurricanes Katrina and Rita in 2005. The incumbent told CBS News affiliate WAFB that this is the first time in 24 years that she is not on an election ballot and she's enjoying the vacation from the political sniping. "They would have begun attacking me because that's just the way the political game is played," Blanco said. "What I'm hoping is that the right person gets elected who will not stop the momentum of the things we have accomplished in our four years, but build on it." When he takes office in January, Jindal will become the nation's youngest governor in office. He pledged to fight corruption and rid the state of those "feeding at the public trough," revisiting a campaign theme. Political analysts said Jindal built up support as a sort of "buyer's remorse" from people who voted for Blanco last time and had second thoughts about that decision. Blanco was widely criticized for the state's response to Hurricane Katrina and she announced months ago that she would not seek re-election. But the two multimillionaires in the race - Boasso, a state senator from St. Bernard Parish, and Georges, a New Orleans-area businessman - poured millions of their own dollars into their campaigns to try to prevent Jindal's victory. A victory Saturday would be a rare trip to statewide office for a minority in the South - in a state that 16 years ago famously saw a former Ku Klux Klan leader, David Duke, in a runoff for governor. Duke lost that race. The victory marks a rare trip to statewide office for a minority in the South - in a state that 16 years ago famously saw a former Ku Klux Klan leader, David Duke, in a runoff for governor. Duke lost that race. State Elections Commissioner Angie LaPlace said she had expected many complaints because a check of voters' addresses found that a "ton" had moved, and those whose mail is forwarded must vote in the precinct where they now get mail.